The maximum amount that people can claim annually from the Access to Work scheme will increase to £59,200 on 1 April. The money is used to pay for additional support requirements in the workplace as the result of a disability. Last year, more than 27,000 people received support. A shocking 93% of homes in the UK don’t meet basic accessibility standards. Yet nearly three quarters of people in a recent poll for the Centre for Ageing Better believe that all new homes should be built to meet the needs of residents of all ages and abilities, and almost half think that society doesn’t do enough to support people to live safely and independently. Many developers are reluctant to build accessible homes, frequently arguing that purchasers without specific needs won’t buy them. This poll suggests the opposite. The Treasury and Work and Pensions Committees urges the governors of the Motability charity to “stop making excuses”, provide full evidence to the committees’ ongoing investigations and fully implement the NAO’s calls for reforms to the scheme’s financial management. 2019 Benefit and Pension rates published: So far we have the Benefit and pension rates from April 2019 to 2020. If you have a health condition or disability, finding an accessible toilet that’s clean, tidy and available for you to use can be a challenge. And they’re often kept locked. Be in Control and buy a Radar Key for priority access to over 9000 accessible toilets in the UK. 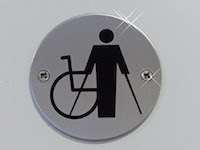 Under Radar’s scheme, special locks are installed on public disabled toilet doors to give disabled people priority access. Local authorities have adopted the scheme and ‘Radar toilets’ can now be found in shopping centres, pubs, stores, bus/train stations and other locations nationwide. Owners of the toilets will have a key but why wait for staff members when you could have your own key? Don’t risk a cheap copy! Radar locks have very tight tolerances which need accurate keys. A copy may work sometimes or not at all. Is it worth saving a couple of pounds if you can’t spend a penny? Kamran has also written an article about how he first left home and wonders whether disabled people today are in a position to do the same, given the current shortage of suitable accessible housing. Government report to UN on our rights is ‘clutching at straws’: Last year the UN looked at the UK’s record in implementing the Convention on the Rights of People with Disabilities (CRPD). Its conclusions were very critical, so much so that the UK government were asked to respond to some of the criticisms within 12 months. Equality Act animation: As part of the Right to Participate project, funded by the Legal Education Foundation, DR UK has created a short animation about the Equality Act http://righttoparticipate.org. This is a ‘light touch’ introduction to the Act. It’s primarily aimed at disabled people who might not usually think of themselves in those terms or be aware that they’re covered, for example young people, students and people who’ve recently acquired an impairment. Please watch and share the video as widely as you can. Following very deep concerns raised by disability groups and organisations, and even a meeting with TPE staff by the Rail Sector champion Stephen Brookes.